Mental Toughness is the second mountain of SEALFIT training, hinting that it is not an easy “climb.” The ancient Greeks understood and embraced the concept of using hard physical training to develop the mind along with the qualities of good citizenry…such as discipline, honor, integrity, teamwork, fortitude and compassion. Those who have spent time in hard labor jobs such as first responders and military warriors understand the value that hard physical training brings to developing mental toughness. The Greeks did not just rely on a good workout to develop their warriors, nor do we. 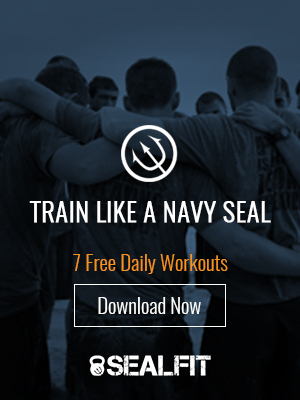 At SEALFIT we like to carve out Mental Toughness and work on it as a core competency and essential requirement to be fit and live a good life. A key tool we use to develop a strong mind is team training. To have a strong team behind your actions has many benefits that translate to mental toughness development. Training with a team that shares your thirst for self-mastery is a powerful force for developing your fullest human potential. On a team we operate in the complex world of “others” rather than the relatively simple world of “me” – thus we are forced to up our game mentally (interestingly we up our game physically as well). This happens because the trainee now needs to be engaged in more challenging activities to accomplish the training task – such as planning, goal setting, coordination, and leveraging the team’s assets while covering for weaknesses – all while being held highly accountable and risking exposure of your own weaknesses. This “team effect” forces one to step it up a few notches. You must develop greater awareness, communication and razor sharp problem solving while under stress…in essence you are developing your mind for the rigors of leadership and being a good team player. This is a far cry from the days of strolling around globo-gym waiting for a treadmill to open up! Another valuable way to develop mental toughness is to get out of the gym and into the arena. We strive to train like we fight. Though the gym is an excellent tool it is an artificial environment that can lead to complacency and a false sense of security. When we face a real challenge outside of the gym, the gym preparation may not have prepared us for it, thus weakening our mental fortitude and unbeatable spirit. Therefore we try to get out the gym and do our training in the real world. If you like to lift heavy in the gym, then get out and lift something heavy in the woods. If you like to run, get off the treadmill and do an obstacle course or trail run. Challenge your mind and body in new ways to avoid the rut of gym training. There is a big difference between working out and training. Training is about using our bodies in the same manner that we operate. Always remember that training is practiced in an artificial environment, and our goal is real world application. As you can see, taking the time to grow and develop your mind is important if you want to become mentally tough, resilient, and durable. This is why I consider Mental Growth one of the most important Mountains of Growth.